With spring in the air, we thought our toy of the month should reflect the general theme of blossoming and blooming that’s happening all around us! As we welcome this season of new growth and having fun, Great Explorations is excited to announce the Hoberman Sphere as our toy of the month! The Hoberman Sphere is both an architectural feat and practical toy. It can shrink down to a portable size, letting you store it in a diaper bag or “busy bag” while you’re on the go. It’s mesmerizing for kids (and adults!) and comes in three different sizes: mini (on sale for $8.50), average (on sale for $24), and mega (on sale for $85). April is almost here and again we are thrilled to partner with The Florida Aquarium to offer members from both organizations free admission to the other. Admission to The Florida Aquarium is valid for all Great Ex members listed on the Great Ex membership for the entire month of April! In return, The Florida Aquarium members are offered free admission to Great Ex for up to 5 members listed. Great Explorations will host a FREE program for adults with memory loss. Participants will take part in programs focusing on art, music, movement and stress reduction and will enjoy quality time with others. This monthly event is sponsored by AARP and presented in partnership with the Alzheimer’s Association Florida Gulf Coast Chapter. Additional support is provided by Harmony Home Health. This month our theme is Spring Fever and we will enjoy April Fool’s Day with a magic show from Thomas Hayden, sing-along songs with Larry Lewis and Cyn Alicea from Arts4All Florida will lead us in Mindful Moves. As always, the program will incorporate art, movement, humor, brain boosts and brain-healthy recipes along with socializing and light refreshments. The program will be held at Sunken Gardens upstairs in the Garden Room located at 1825 4th Street North. For more information, contact Lael Arango at larango@greatex.org. On Wednesday and Friday mornings, before we open to the public, members are invited to join us for songs, movement, art and story time in Great Beginnings at the museum! Terrific Tots is a unique bonding experience for children ages 1-3 and their caregivers. This is a great community time for tots and their adults! This program is FREE and is available for Members only. Explore art, music and language with your little one in this fun and safe environment. At the beginning of each class, we will join in sing-a-longs that encourage movement and caregiver involvement. Please note that on Fridays we tend to get MESSY with our activities so we encourage participants to dress accordingly! For questions, please visit greatex.org or call 727.821.8992 x 226. The additional activities happening inside the museum will be included with regular admission or are free for our members. Drop off your children (ages 4 -10 and potty-trained) for a night of fun at the museum with our Exploration Team while you take some time for dinner, shopping or just a night for yourself! Children can play in the museum, watch exciting science shows and wind down the evening with a G or light PG-rated movie. Pizza, snacks, and juice are included. Advanced registration is required. http://greatex.org/programs/parents-night-out/ Please contact education@greatex.org or 727-821-8992 x 225 for more information. Great Explorations will modify lights and sounds and will provide a “cool down” room for families who need to take a break. This is a wonderful opportunity to connect with other families and community resources while the kids enjoy the power of PLAY! Cost: $5 per person and is free for GreatEx members! Contact Lael Arango at 727-821-8992 x 209 or larango@greatex.org for more information. The Great Ex STEAM team is on the move and out in the community at lots of wonderful events available to the public. Stop by and play! Spring is in the air and we will have beautiful lilies, hydrangeas and chrysanthemums for sale at the museum gift shop daily until 4:30 pm and on the museum floor from 4:30-5:30 pm. Prices will range from $10 – $15 and proceeds will benefit educational programming at the museum! 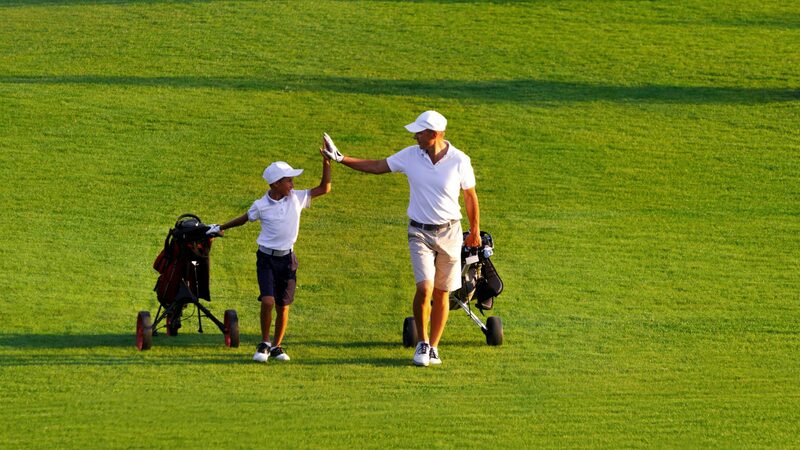 Great Explorations is thrilled to present our First Annual Senior-Junior Charity Golf Tournament on May 4th. The funds raised will support educational programming at the museum and out in our community. This 9 hole scramble, alternate ball, shotgun start tournament will be a perfect opportunity for the Junior (15 and under) to learn, have fun and help raise money for a great cause along with their Senior (16+) partner. The tournament will be held at Cypress Links Golf Course in St. Petersburg.